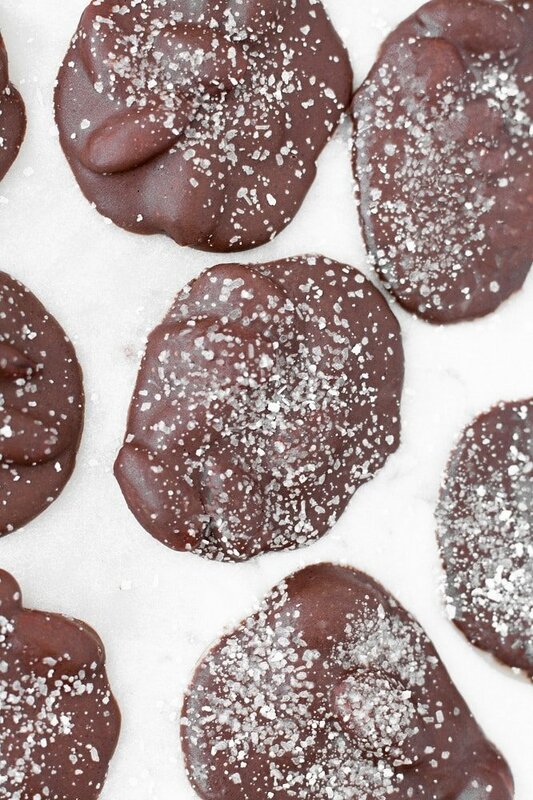 The sweet, salty, and crunchy flavor combination of these Sea Salt Dark Chocolate Almond Cluster Fat Bombs are absolutely UNREAL. The best part? 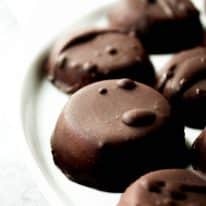 They are full of healthy fats, contain minimal carbs, and will keep you full, focused, and satisfy all of your chocolate cravings, all in one bite! 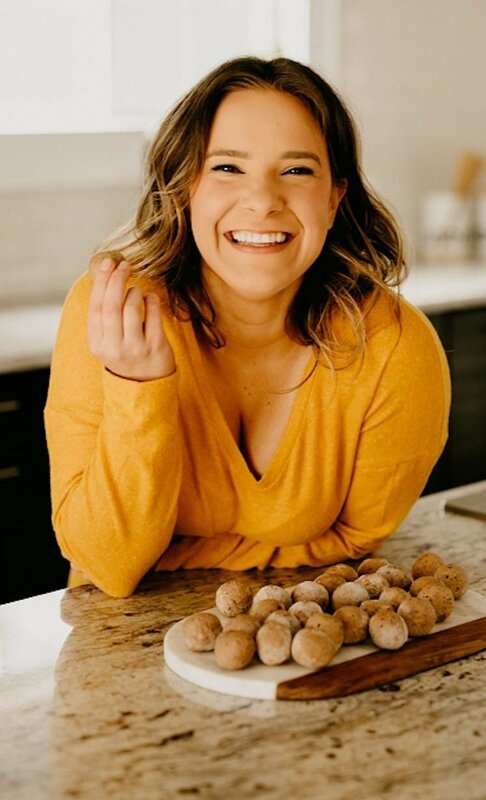 Fat bombs are a great way for those who follow a ketogenic, low-carb diet to enjoy a dessert without being thrown out of ketosis! They contain healthy fats that will keep you satiated for hours and are sure to give you an extra boost of energy to make it through your day. 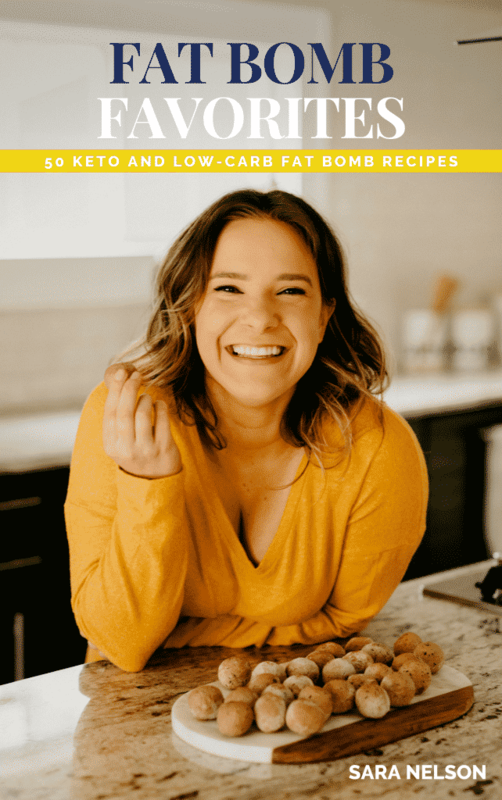 Over the weekend in our household, we love to batch-make multiple Real Balanced fat bomb recipes so we have them on-hand for the times during the week we need a little snack to tide us over between meals or for an after-dinner treat! 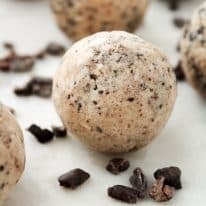 These fat bombs, like many of my other ketogenic dessert recipes, are sweetened with my favorite sweetener, Lakanto Monk Fruit Sweetener. 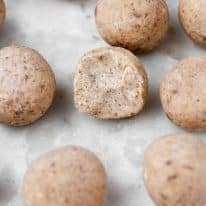 In this particular recipe, I use Lakanto’s Classic Monk Fruit Sweetener, a natural sweetener that contains zero calories and will not spike your blood sugar. Over the years, I’ve tried maaaaaany keto-friendly sweeteners, and monk fruit sweetener still always wins out in terms of flavor and texture. If you’ve never tried monk fruit sweetener or just need to re-stock your pantry, you can use the code “REALBALANCED“ for 20% off your Lakanto orders! Keto and Low-Carb: These clusters are full of healthy fats and contain minimal carbs (only 0.8 grams net carbs per serving!). Vegetarian: This recipe is compliant for those who follow a vegetarian diet lifestyle. Refined-Sugar-Free: Made with monk fruit sweetener, this recipe is free from refined-sugar. One fat bomb contains 0.8 grams of net carbs. 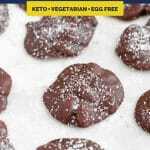 This recipe is keto, low-carb, gluten-free, grain-free, vegetarian, and refined-sugar-free. 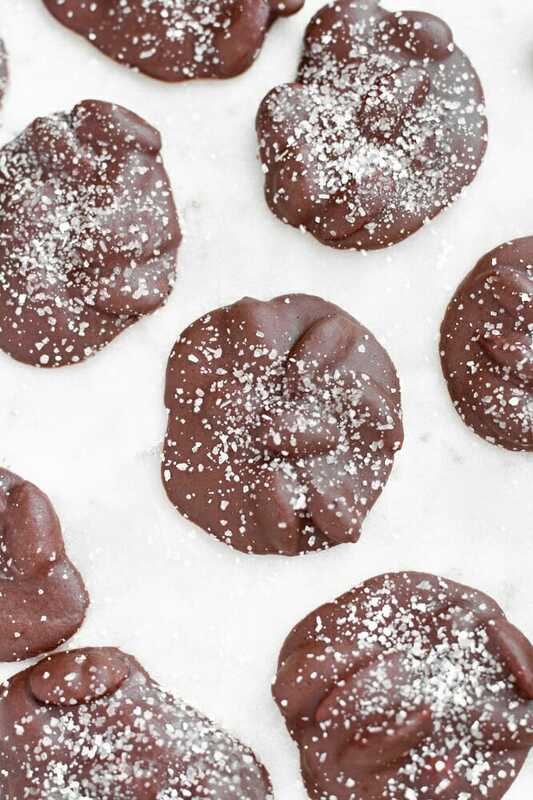 These Sea Salt Dark Chocolate Almond Cluster Fat Bombs are a perfect keto-friendly and low-carb dessert to satisfy your craving for chocolate! This recipe is keto, low-carb, gluten-free, grain-free, vegetarian, refined-sugar-free, and contains only 0.8 grams net carbs per serving! Preheat oven to 300 degrees and line baking sheet with parchment paper. Add almonds to baking sheet in an even layer. Bake almonds until toasted, about 10 minutes. Line a separate baking sheet with parchment paper. To a small glass bowl, add cocoa butter, cocoa powder, heavy whipping cream, and monk fruit sweetener. Using double boiler method on stovetop over low heat, melt ingredients together until chocolate is smooth. Whisk mixture frequently to avoid burning. Allow clusters to sit on baking sheet at room temperature for 30 minutes before transferring baking sheet to refrigerator to chill until hardened, about 25-30 minutes. 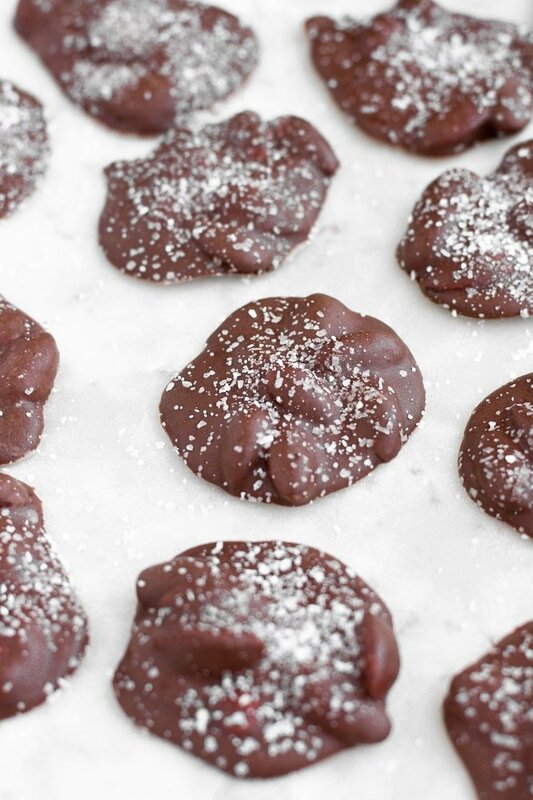 Once chocolate has hardened, gently pull parchment paper away away from clusters, serve, and enjoy! Storage: Store clusters in airtight container in the refrigerator. Sorry you had trouble, Lori! Did you use a double boiler? If so, it’s important that the water in the pot is low enough that it doesn’t touch the bowl with the chocolate ingredients in it. I exactly followed the recipe (twice) and found that the fat always seems to separate from the chocolate mixture. Any suggestions? I’d venture to say it was because of the temperature change from the time the chocolate was melted to solidified. I’ve had this happen to me before, but never with this particular recipe! Based on this, I think it may either be because of the climate you live in and/or the the temperature of your refrigerator so, in knowing that, while the chocolate clusters are still in melted form, allow them to sit at room temperature for 30 minutes to an hour before transferring to the refrigerator to fully chill. Thank you for the recipe. I divided one cup of sliced raw almonds into a silicone mold. I then poured the melted ingredients over the almonds. Frozen, they popped right out and turned out delicious. ?